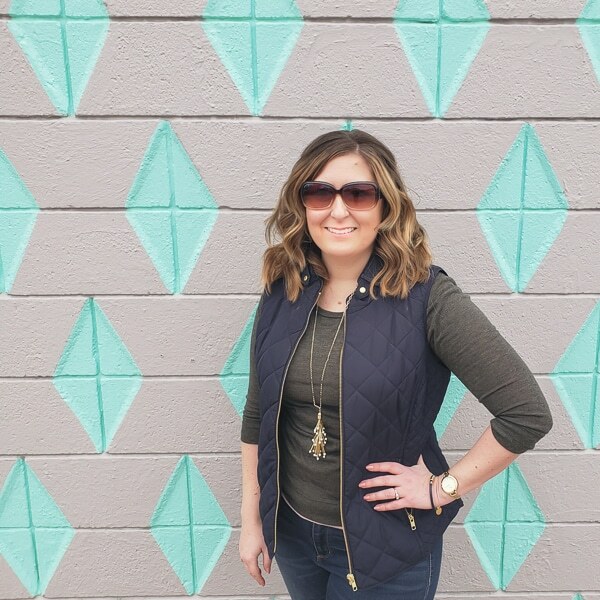 I teamed up with Bon Jovi to write my Week #3 One Room Challenge update. Okay, okay, MAYBE Jon has no idea who I am. Or what’s going on in our kitchen. But it VERY accurately describes the current situation. We’ll make it, I swear, but it’s going to take some teamwork and prayer! Although Corey was in LA at the Adobe Max conference 5 days this week, I still made progress while I was living up the single life…at home in fuzzy pajamas. The upside of being a team of one this week meant learning a new life skill. I was trying to knock out all the smaller projects I could, like painting the pantry door. 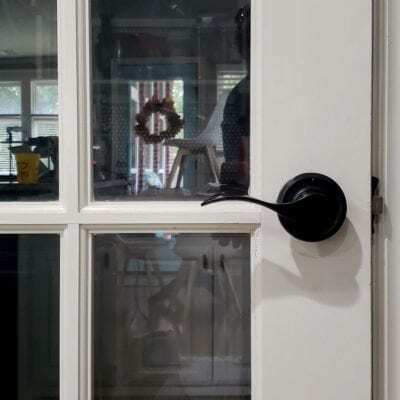 To paint the door, I needed to remove the old door handle because it is being replaced with something more modern. It took a minor amount of elbow grease and a bit of troubleshooting how to access the hidden screws, but overall the process was easier than I expected. So easy that as soon as the paint was dry, I was confident I could install the new handle as well! I was right – the install took MAYBE 5 minutes. Anyone could do it! I love the new slim square lever! And the SW Tame Teal paint makes me do a happy jig every time I see it. 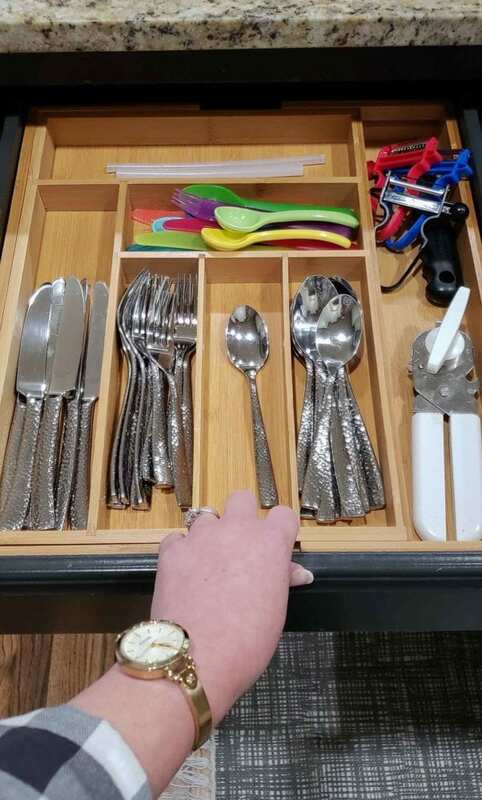 The next part isn’t anything you’ll see in the reveal photos, but while I was shopping for other kitchen items, Amazon convinced me I needed a new silverware drawer organizer. The other one wasn’t big enough so always slid around. I love that this model expands to fit. The old silverware organizer then found a new home in another drawer. Ahh, sweet, sweet organization. 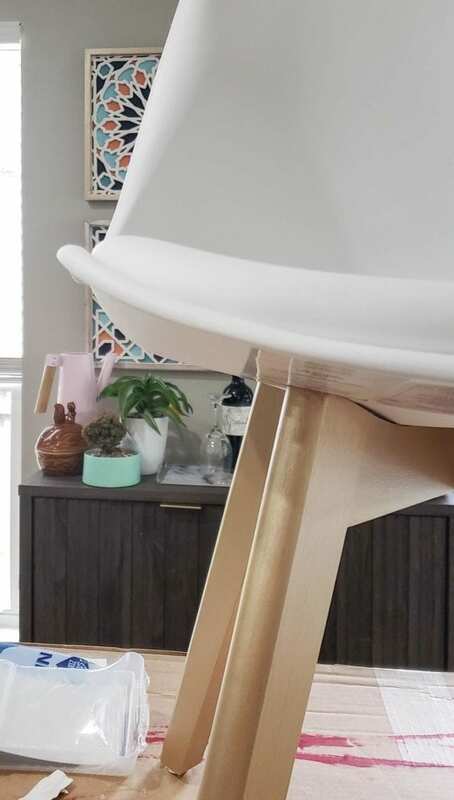 I spent Tuesday evening painting the wood legs of all our kitchen chairs soft gold. When the sun hits them, they’re perfect! However, stay tuned because the legs may change again. Sometimes, they just look sad tan when the light isn’t hitting them. I’m going to wait until the rest of the area comes together and then decide if they should be another color. The best thing about paint is that you don’t HAVE to get it right the first time. 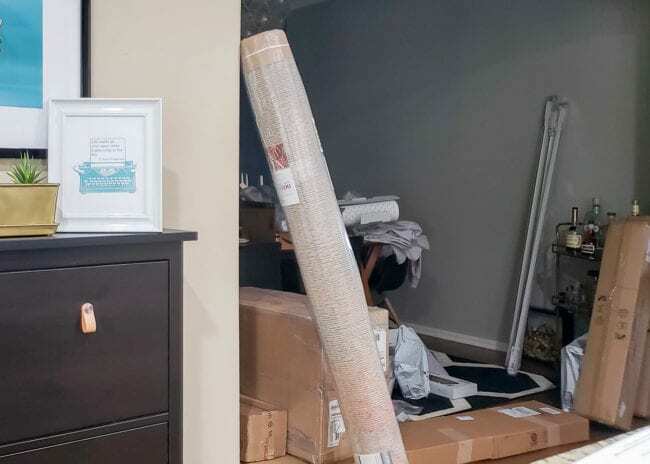 The next pic has a sneak peek of the new shoe cabinet hardware, and a scary peek of what not only the dining room, but the living room and entryway look like this week. 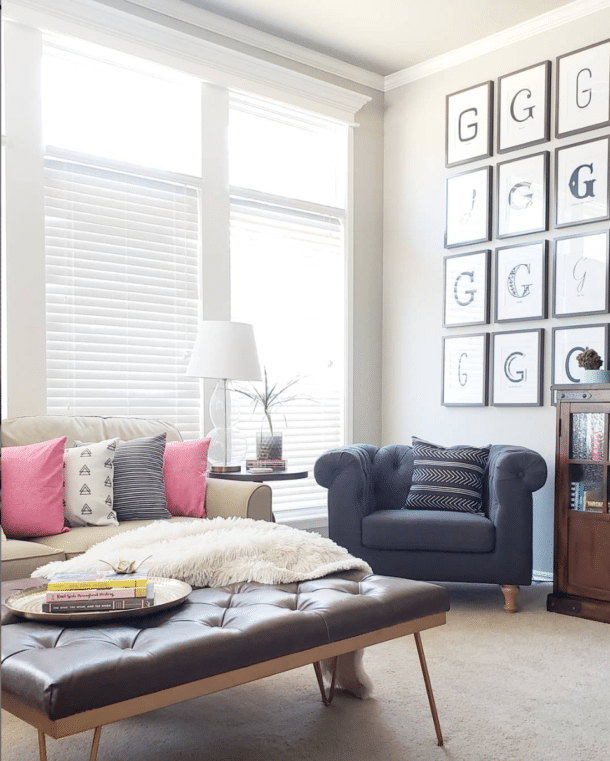 Pretty decor becomes so chaotic when it’s covered in cardboard! I’ve been torn between wanting to show you everything as we go and wanting to keep some things for the reveal, so true to my personality, I landed on a middle ground. Here’s HALF of one of the new barstools! The barstool buying process was quite stressful. Every time I found one I loved, the store was out of stock until after the One Room Challenge. And not just one or two stores…FIVE different cognac leather counter-height barstools were sold out. The upside is that I spent so much time searching that I have an awesome list of leather barstool options now. I’ll share those in another post soon! Here’s a little recap of what I finished and what we have left. My real goal for this week to is to tackle things in a logical order and not the order of my whims. We’ll see how that goes. Don’t forget to check out the One Room Challenge site to see what everyone else is up to this week! « The Kitchen Gets Botox #2! I LOVE the new barstools! Can’t wait to see more! Thanks Jenn! I was so relieved when they arrived and were comfy too! Fun updates Melissa! I love the hardware! Thank you, Jewel! I’m THRILLED with it and of course, now want to order it for the rest of the house too! 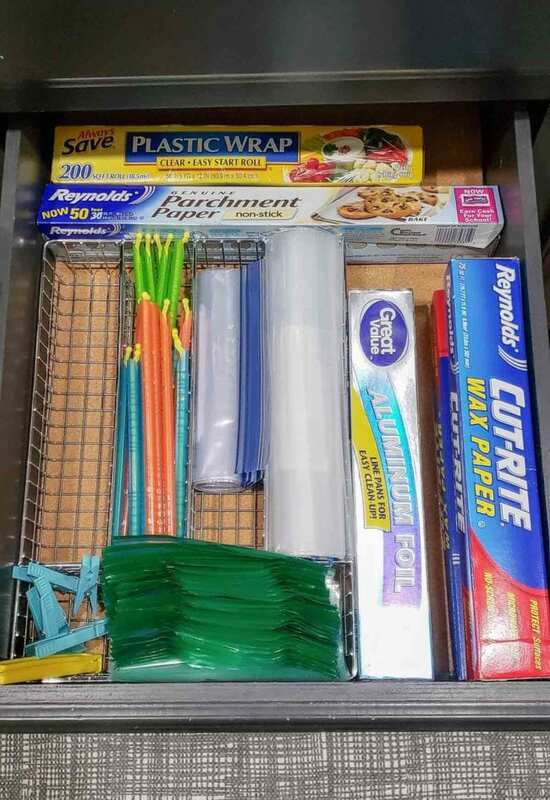 I bought that kitchen drawer organizer from Amazon awhile ago … don’t know how I lived without it !!! That’s how I feel about it! It’s such an unexpected joy every time I get a piece of silverware! Thank you Lisa! I’m SO anxious to get the light fixtures swapped out. Everything that I can see looks great! That soft teal paint is gorgeous as is the door handle. 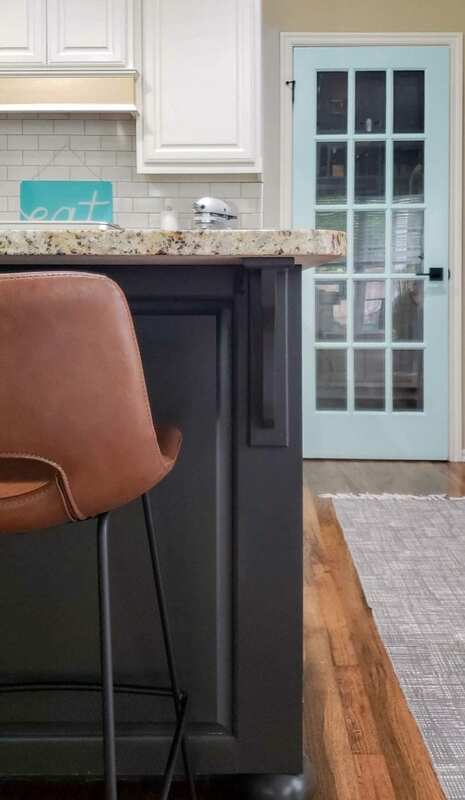 Also, the stools really look comfy, and I noticed they come in the counter height. Glad you are going to give us some info on where to find stools! Could see your cabinets and would like to know about the paint as I plan to paint mine after Christmas. That gold stripe on your vent is a very creative touch! You are amazing! The stools are comfy which was a huge priority and made us nervous ordering online without sitting on them. I’ll definitely report back on how the paint goes. We’re using the same Sherwin Williams cabinet paint that I used on the door (I just bought it at Lowes but will add a picture in the paint post). 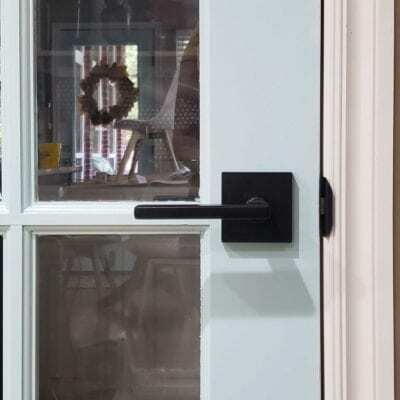 That aqua door with the beautiful hardware has my heart! Can’t wait to see the end result! Thank you Beth! I’ve been dreaming of painting that door for so long!